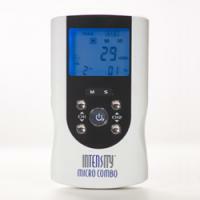 The InTENSity™ Micro Combo is a Microcurrent device that lets the patient switch from TENS therapy to Microcurrent therapy, allowing them treatment of a variety of musculoskeletal issues. TENS/EMS Units & Stimulators can be found in our extensive online collection of products from globally recognized and trusted brands, including Current Solutions. An excellent option to consider is the InTENSity Micro Combo.